I really think the key is to just pick a template or two and one photo that represents the day and go with it. I don't need to fill the day with several photos, I just need to tell the story of the day and make it quick and easy so that I can have fun with the kiddos. DAY FOUR: We put together the kids' tree in the family room. I just resized the image to 6"x8" and added an element and font (number) and clipped a paper to them. Then I adhered it to the back of the previous page and punched out my holes. 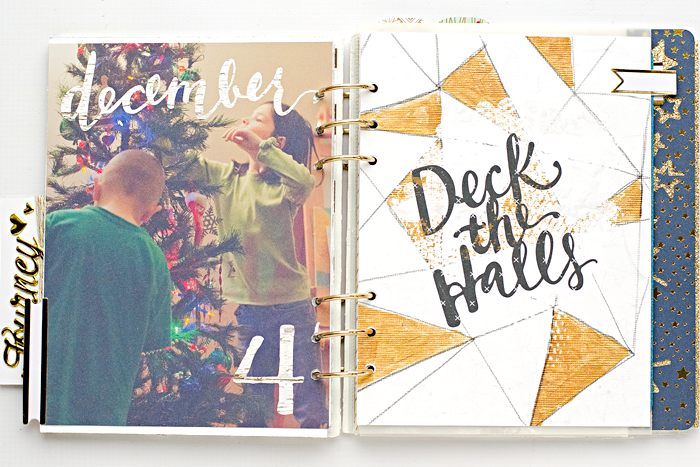 The "Deck The Halls" page was previously created. DAY FIVE: I spent most of the day decorating for Moriah's birthday party. A good portion of that time was untangling several snowflake garlands I had made ahead of time thinking I would save time, LOL. 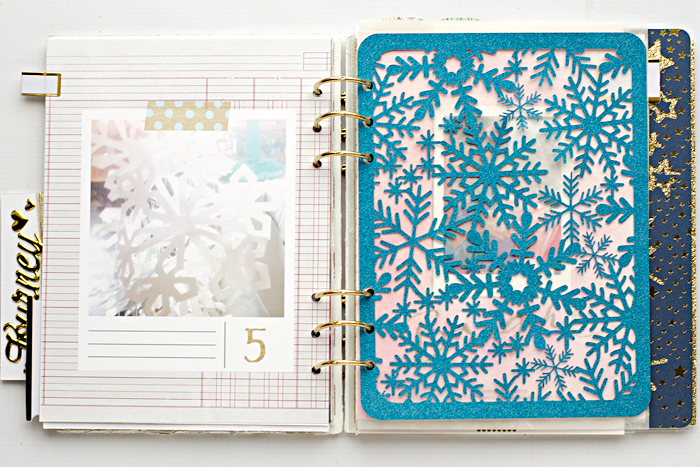 I totally love this snowflake 6"x8" cut file by Sweet Elsie in the Silhouette Design Store. These Insta Album templates by Lauren Reid are actually the 3"x4" templates that I increased the image in Photoshop to 6"x8". DAY FIVE FILLER: I left the back of the cut file alone. I wanted the transparency to show but I wanted to soften up the next day. To do that, I added some frosted vellum behind it. DAY SIX: This was Moriah's Frozen® inspired birthday party. I loved seeing her with her girlfriends and that bright huge smile. The "Bright" template just seemed too perfect. 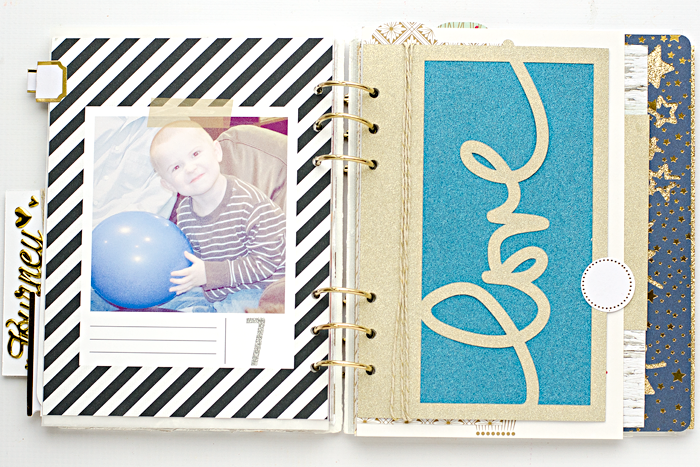 The background is actually a 3"x4" journal card that I increased the image of in Photoshop to make it a 6"x8" page. DAY SEVEN: We had so much going on on Sunday and I noticed that Asher hasn't been in many photos yet, and I just adore this look he was giving me at our small group's Christmas party while we were singing Christmas carols. Such a sweet boy. I also backed the "Love" cutout with some of the leftover turquoise POW glitter paper. I did the same thing with the template as I did earlier, increased the size in Photoshop. DAY EIGHT: The kids love to read The Advent Book every night. Moriah is old enough to read it so she reads it while the boys help her keep the doors open. There is one part in there that talks about how the baby inside of Elizabeth "jumped for joy" and the kids all love to jump up in the air at that part. I couldn't resist capturing it, because it's one of my favorite daily moments. I used the "Celebrate" template and switched out the word with "joy". The star was a cut out I had done ahead of time, so it was an easy addition. This is what I have so far, and I'm really loving how it's looking so far. The gold, white and black, with just a few pops of color make me so happy! 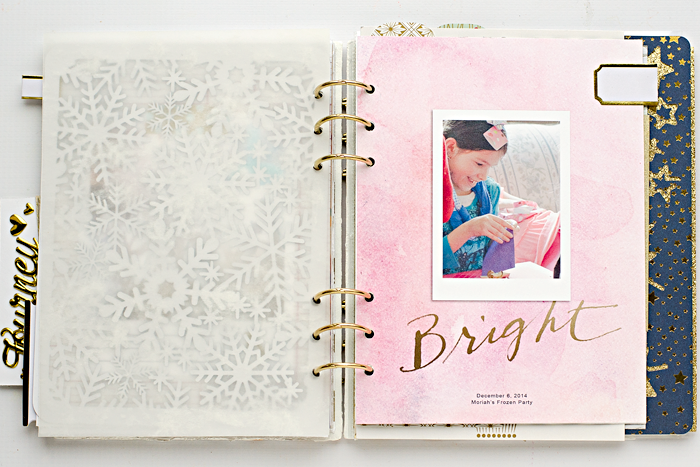 Since I'm only using one photo from each day, I will use the other photos and add them to my weekly pocket pages. I also find that it also helps that I had created several filler pages ahead of time. I don't have to think about it. 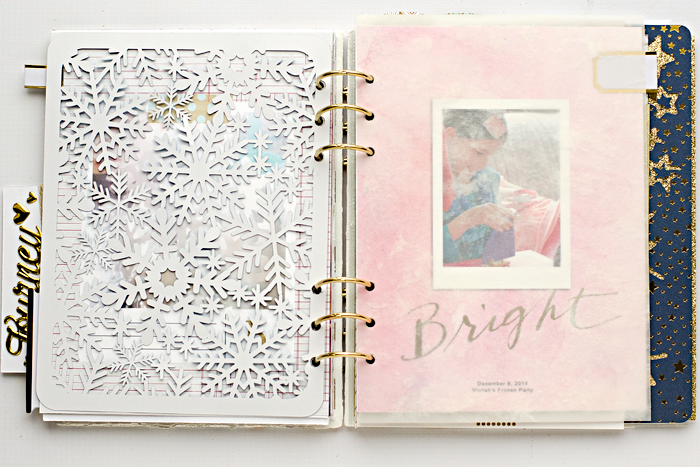 Just do the one page using one of the awesome templates and add the fillers in between. Easy Peasy!